Russian Presidential Elections results announced! 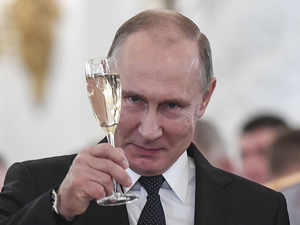 Vladimir Putin will continue to be President of Russia for another 6 years after securing victory in the presidential election. An official Russian state exit poll says he will win up to 74% of the vote. The only major opposition leader, Alexei Navalny, was banned from the race. The size of victory is a significant increase from 2012 when he won 64% of votes. The state exit poll put the turnout at 63.7% which is down on 2012. Putin's campaign had hoped for a larger turnout in order to give him the strongest possible mandate but it appears more voters stayed at home. Putin's closest opponent, Pavel Grudinin, is expected to win around 11.2%. Mr Navalny was barred from the vote due to an embezzlement conviction that he said was made up by the Kremlin.